At Artomé, we strive to create the best Art Show experience for your school. Often, this is the first time a child has seen his or her artwork professionally framed and on display. This special moment creates a life-long memory for both the Art Student and their parents. This is the Artomé experience. Artomé is the most experienced youth Art Show provider in the industry. Our team has been involved with thousands of school Art Shows over the past six years and we love what we do! Our team began working with elementary school Art Educators in 2007 and we are continuing this tradition through School Art Shows by Artomé. 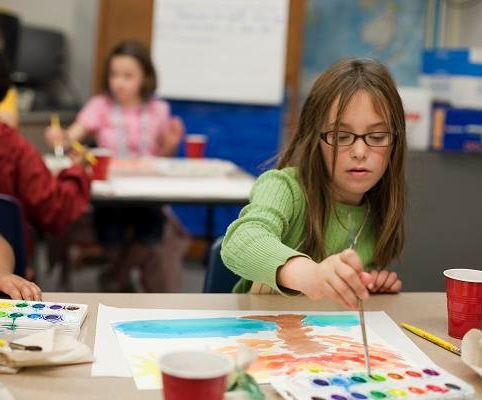 We are the most experienced Art Show partner for elementary schools and preschools. We offer the best value for Art Shows and Art Fundraisers. Simply put, there is not a better way to advocate for the Arts in your school than to schedule an Artomé Art show, We love what we do! Art Shows provide a fabulous combination of celebrating creative expression, stimulating imagination & creative thinking, and building self-esteem among children. Our school-wide Art Shows include a framed original work of Art for every student in your school. Our value is the best and our prices are the lowest in the industry because we manufacture every frame, cut every mat, and frame every piece of Art in our manufacturing facilities; we pass along our low costs to you. We charge the school $19 per frame for only the frames that are purchased! We allow our customers the simplicity and flexibility to run Art Shows your way. We support you with marketing materials, we provide art paper for each student, we frame a piece of Art for EVERY child in your school, and we set-up & breakdown each Art Show. We also give our schools the freedom to set the price for our frames resulting in a wonderful opportunity to raise much needed funds for the Art Program. We charge the school $19 per frame and only if they are purchased. Each school sets the price they wish to charge parents for the framed Art and collects the money for each piece sold. We let you focus on teaching, we take care of the rest!